What defines a hero? Is it enhanced abilities, heightened senses, super-strength, or is it something else altogether? A hero is someone who inspires others, someone who sets an example. Someone who sacrifices everything to help people, putting others before themselves. That’s why Spider-Man is everyone’s hero. An ordinary person of humble origins, gifted with extraordinary power, forced to accept the responsibility that comes with it – just as many people have to in some part of their lives. Through personal tragedy, his misery produces a profound sense of empathy for others, leading him to use his powers to prevent ordinary people from having to face the pain that he can prevent. His personal sufferings don’t affect his mental stability, as he keeps his head up, living with the pain in the best way he can. He’s everyone’s friendly neighborhood Spider-Man. That’s why people adore him, and that’s what makes him a powerful pop culture representation in our world today. These traits are all well characterized by people like Miles Morales, and Peter Parker, only making this film all the more enjoyable. Miles Morales, voiced by Shameik Moore, is an ordinary teen in Brooklyn, doing his best in the new advanced school he’s been placed in. His father is a New York Police officer, and his mother is a busy nurse. He has plenty of friends, and an uncle he absolutely adores. His uncle, voiced by Mahershala Ali, is charismatic and is so amazingly portrayed in true comic book style. And that’s when, Miles gets bitten by a genetically modified spider, and his life transforms completely. He meets spidermen from alternate realities, who play their own part in helping Miles understand what he’s meant to be. The entire voice cast is energetic, alongside the endlessly creative animation, that there’s never a dull moment. 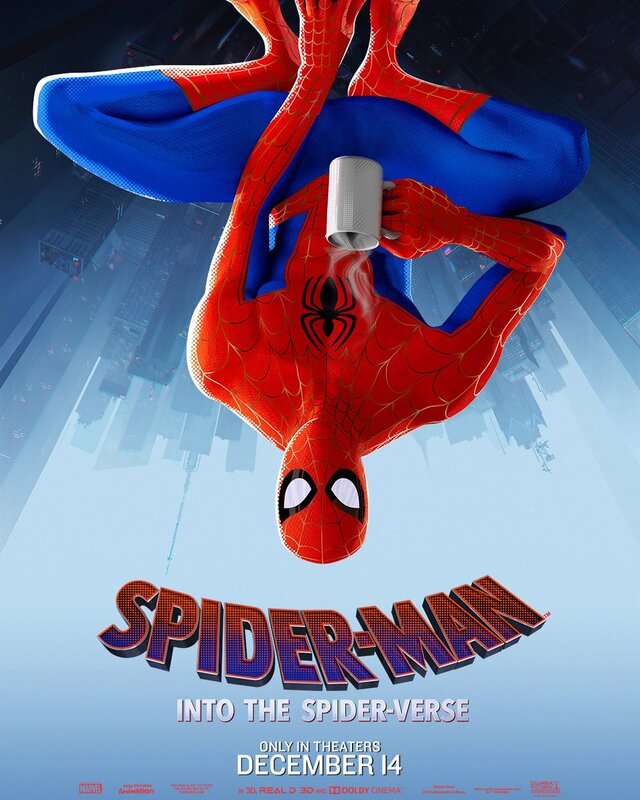 The movie plays an interesting perception of the Spidey sense, with Miles initially believing it as a symptom of puberty – magnifying his teenage angst and insecurity. He is driven by a promise he makes, and his undying will to make change for the better. And his powerful character is well balanced by an equally sympathetic and much older Peter Parker; who is from an alternate universe. What makes this Peter Parker so emotionally meaningful, is that he has worked past his fair share of failure, and isn’t in quite the best physical shape. The film emotionally appeals to two very different audiences. While Miles is the character that younger viewers will more closely relate to, this older Peter Parker reflects the aging Spider-Man audience. Portraying Spider-Man at a different point in his life played an important component of the character. This Peter Parker has been through harder times, and along the course of the film, his performance manages to show the audience an entirely new aspect of the Peter Parker character we know so well. And in addition to that, Miles Morales’ father also provides a soulful performance, with a different connection with his son from the Peter Parker-Aunt May relationship we are used to. Apart from the intriguing and creative art style, the film is also filled with light humor. Including references to previous movies like the Sam Raimi Spider-Man trilogy, as well as a meme we are all too familiar with. Something I won’t go into depth with, letting you figure out yourself if you haven’t already. The humor nicely livens up the serious tone of the film and sparks laughter from all of us. Along with each of the different multiverse spider characters who represent different genres, there are plenty of different jokes that are played with. There’s Spider-Woman, who upon their first encounter, despite their comical situation becomes a good friend. And Spider-Man Noir, whose dialogue is filled with ironic noir clichés, and the remarkably sincere anime-influenced Peni Parker. And of course, one of my favorite characters in the entire Marvel Cinematic Universe…the talking pig Spider-Ham. Serving as brilliant comic relief with his bizarre comments and actions, Spider-Ham warranted warm laughter from the entire audience. But I believed that one of the movie’s most outstanding features was the soundtrack. The intense music has an electrical-modern spin on it, making for thrilling and entertaining action sequences. IMO – The best background score for a superhero movie yet- even more so than Black Panther. Daniel Pemberton, the brilliant man behind the background score, had done a tremendous job, beautifully blending the music into the entirety of the comic book style movie. If I could express how much I loved this film into a rating, I would – but I don’t feel that it would do the film its due justice. As they say, a picture tells a thousand words, so I’d suggest you watch the movie, and I can assure that you won’t be disappointed. 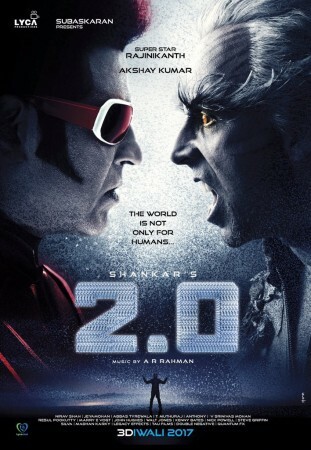 After a long-awaited release, “2.0” is out and has certainly managed to live up to its expectations, and in my opinion definitely surpasses the first installment. The film is quite grand and ambitious and certainly makes a heavy imprint on the science fiction genre of Indian movies. The basis of the story revolves around cell phones all around India being sucked away, and no one is able to find them, leaving the nation of India in a state of panic. It comes to a point in which the government has no choice but to allow for ‘Chitti’ the iconic robot from the first installment to return – and the story unfolds from there into a plot of vengeance, and vigilantism. In this movie we are introduced to more than a few prevalent characters aside from the cast we are already familiar with. Nilla, a charismatic, humanoid, robot assistant for Dr. Vaseegaran. Pakshi Raj, played by Akshay Kumar, as an ornithologist who has a strong desire to protect birds. And then there is the vengeance-seeking scientist Dhinendra Bohra. All of who contribute powerful importance towards the general aspect of the film. One of the best is Nilla, played by Amy Jackson as a main supporting character, and performs amazingly. Her appearance as a robot only requires her to act to a certain point, and that itself is done well. In the end, Nilla ends up becoming pivotal towards the climax, when dealing with the…cell phone thief. There is also ‘Chitti 2.0’, who is ideally the same villainous character shown in ‘Enthiran.” The entire audience was hyped to see his personality return to the film and worked nicely towards the climax. ‘Kutti’ who also plays an important role, was a really funny and interesting character. He has a dark yet heroic character, with a playful attitude, casually irritating and threatening the villain. Director Shankar has clearly invested an immense amount in the visual aspects of the film, which make up of nearly the entire film. The graphics of the cell phones whether it be when they are stripped from the people, as well as the when the cell phones compile together to create a massive beast – are outstanding – especially when watching in 3D, which I do recommend. The VFX in every scene was spotless, which made watching the movie a splendid experience. However, there was one small thing I didn’t like, the scientific explanations. The movie is held together by unsound science and heavily revolves around the concept of ‘negative energy,’ ‘positive energy,’ and ‘aura’ although much of that isn’t quite thoroughly explained. Although this can’t quite be considered a fault, due to the extents in which they did attempt to prove said science. There was one thing, however, I did find hilarious, the motion Chitti or any robot for that matter made when they ‘ran.’ To be honest, I don’t know if you can even call that robotic slow pumping of the arms and legs as running but I’ll leave that for you to decide. The music in this film, composed by AR Rahman’s plays it’s role behind the curtain, due to the lack of many songs. Although, when there are moments in which the music has room to take over, he executes it beautifully. In the end, everything falls into place in the final fight, when both AR Rahman and Director Shankar’s brilliance come together in harmony. With devout imagination, the fight sequences, and music go hand in hand leaving the crowd in awe with its creativity. The movie ends on a powerful note, on how the radiation emitted from both cell phone towers and cell phones are harming the environment, including all the living things in it. The science in that area is very confounding, on how cell phone companies increase the rate of frequency higher than allowed, merely to reach more ‘subscribers’ as they continually mentioned. I thought it was a powerful statement that deserved to be heard, and was very well implemented into the story. At a certain point, however, Pakshi Raja’s approach to the issue isn’t quite…sane, although his intentions are entirely right. The usage of cell phones should be limited, and cell phone companies should be wary of the harm that radiation can do. In the end, I rate this movie a 9/10. Without a moment’s hesitation, I recommend any of you who have not yet seen this film to purchase tickets in 3D and enjoy to the fullest. I hope you enjoy! The visit was a memorable experience, and I would recommend others to go. The outdoors area of the family-owned business gives you a great view to look out from, and as you arrive to check-in, you are greeted by a sweet sheepdog that lightens whatever fear you may have. Before you start, the staff makes a brief, but a detailed lesson on the dos and don’ts of ziplining. The staff was kind and encouraging and they simply explained how to use the zipline, and when making a mistake, would gently correct. It is a little tense at first, though once you have done a line or two, it becomes a breeze; quite literally. The staff even told us that it becomes easier as the lines get longer, and you’re more accustomed to the feel of the zipline, which was entirely true. I personally did the six lines zip line, opposed to the nine lines so I can’t quite vouch for the latter, but the last of the six stretches over a thousand feet and was outstanding. The air whistling past my ears, the gorgeous view below, (the one instance I would implore someone to look down from the height) and the satisfaction when completing it. It all added up to it being an enjoyable experience. I can’t wait to go back. It’s a friendly adventure and everyone you encounter is polite and supportive. When you hold the title for the most expensive film ever made, you can expect something good to chew on for both movie lovers and for non-movie lovers, for both Marvel fanatics, and well…only marvel fanatics. There is sadly no room for Marvel beginners to watch this movie except for purely visual delight, they will understand little to nothing about the movie as it pertains information from all nineteen installments of the Marvel Cinematic Universe. Yet, I do still recommend Marvel beginners to watch this film as it will delight your visual tastes to an astronomical level. Since the focus of the film is the villain Thanos, who’s made appearances throughout a number of MCU films, on his quest to collect the powerful Infinity Stones; it does make sense that familiarity of the movies would prove helpful. And so here is the pivotal question that is answered throughout this movie, “How far would you go to bring peace to the universe?” It’s a question many people have faced, both in real life and in fiction none of which have come as close as to Thanos to reaching their goal. This movie is the beginning of the ending of this series of the MCU. The movie that millions of superhero lovers have been waiting for, the battle to end all battles, the war to end all wars, an opportunity for a movie to provide more fan service than any other. This is when things begin getting serious, jokes aside, which Infinity War does manage to crack many of, this movie is one of the most important installations to the MCU. Thanos already has and has had the Infinity Gauntlet for a good amount of time. The gauntlet was forged by the last surviving Dwarven blacksmith, and Thanos is coming prepared for the battle, going full out. Each infinity stone was creatively placed by the directors of the MCU in different corners of the movies, from Thor to Iron Man, to Guardians of the Galaxy and more. And so this film is the one where all of those crossroads intersect, and the presence of the infinity stones begins to get stronger. Thanos has been lurking in the MCU’s for a long time, being the mind behind Loki’s attack on New York City as well as Ronan’s assault on the first Guardians of the Galaxy movie. Thanos had given up on underlings to retrieve the infinity stones themselves, and so the titan himself decided to get his hands dirty. He sends his minion, to Earth to retrieve two of the stones, while he goes after the others himself. Infinity War doesn’t introduce a lot of new characters, which makes sense considering that they have to fit over seventy-five faces into a two hour and forty minute time slot. One thing Marvel has really outdone itself on is its scene transitions, from one scene to the other, from one character to the other, one conversation to the next. It’s smooth as butter and actually quite pleasant to watch. The Children of Thanos are interesting, but they don’t quite impact the plot of the movie as much as it would seem at first. Infinity War has one of the largest casts in the history of movies, containing numerous characters, from the Iron Man, Captain America, Doctor Strange, Black Panther, Guardians of the Galaxy, Thor, Spiderman, and the Avengers movies. It is no surprise that many of these characters do not get a lot of screen time, or many lines for that matter, but each character is done its due justice in the film. The fact that Infinity War actually feels like a well-balanced movie is extremely praiseworthy. For the most part, this movie was a delight, except that it was countless fighting after the next. It almost seemed like the directors had a puzzle piece and said oh I’ll throw it in here, then one over there, oh wait I’ll take that back. No, I actually want to keep it, no never mind, no add it over there. There is simply too much random fighting, and not quite enough comprehendible encounters. There are a few spectacular fights, but the others are just thrown in there like salt and pepper, what’s the use? There are very few scenes where there is no fighting whatsoever, and after all the movie is about the most powerful creature in the universe, but I felt that there was more than just raw fighting to highlight in this film. The exposition portion of this movie turned out to be a little cheap. Mark Ruffalo (Hulk) was overused as an exposition character. “Thanos has the largest army in the universe.” Well, thanks for that, it really helps, but don’t they already know that? Oh, he’s big and purple and powerful and has this gold glove on his hand. Well, nice job Sherlock, who would have ever known? His line delivery also seemed to be a little cheesy, not very natural, not much emotion, like he was reading off of a piece of paper. But who am I to critique acting, he acts the way he acts and the way the director approves of it, I just see what I see. There also seemed to be some dominant issues between the split personalities of Bruce Banner and the Hulk himself, which I think will be talked about in the second part of Infinity War. This movie was also extremely funny, aside from the break the tension jokes. I truly believe that this film contained a proper amount of required humor. I think that Guardians of the Galaxy film is what really sparked Marvel films to add that extra comedic factor. The actors also have great on-screen chemistry with each other. Iron Man, Star-Lord, and Dr. Strange have the funniest scenes together, they each represent the same kind of character from different areas of the MCU. All three let ego get to their heads, can be immensely prideful, are quick and witty, and also believe that everyone is obliged to do what they say. This movie might be the one Marvel movie that actually gives the villain its proper spotlight, and we are given a good deal of information about the villain as well. I sort of wanted to see Thanos as a child but I knew that wasn’t coming. But, the movie does a decent job fleshing out his backstory and motivations. Although I’d like to say for comic book lovers that this will be a disappointment, nothing goes as per comics, nothing. Josh Brolin plays Thanos with a beautiful balance of character, both an emotional and a menacing person. Josh Brolin is without a doubt the star of this film and manages to deliver an amazing job in his work. The visuals on his facial features and skin movements are also miraculous, the MCU as always, must have really worked their butts off getting the CGI done for this film. Especially the extremely confusing and strange ending, where numerous characters faded away into small pieces. Lastly, the most iconic thing about the MCU, their end-credit scenes which always connect with the upcoming installments of the franchise. And they are always so interesting to watch, the end-credit scene for Infinity War shows Nick Fury and Maria Hill driving in a car, talking about how large scale the Wakanda attack was. They get hit by a car, and when Maria checks on the driver, it turns out that there was no one inside. Maria then fades away just like some other characters, and Fury runs back to his car. He grabs a messaging device from his seat and clicks a button as he begins to disappear as well. The messaging device drops to the ground and reads, “Sending…” on the screen. The screen then flashes and shows the star-shaped design which Miss Marvel’s costume is based on. This may hint at a Miss Marvel cameo in the second part of Infinity War, knowing Marvel it could go in a number of different directions. At last, Infinity War reminds us why and how everyone deep inside, has the same nature. They have the same emotions, the feel the same way about certain things, they hurt the same way and even think the same way. Everyone at heart is the same, we just look different, a concept also evaluated in Black Panther, the previous installment. Over the course of the past nineteen films the MCU has turned out to be a rollercoaster ride, and this movie will definitely not fail to reach your expectations. I give this movie a 9 out of 10. Apart from having a record-breaking box office weekend, it is quite easy to dismiss ‘Black Panther’ as yet another superhero movie, but once seeing it on the big screen, you soon realize that it’s much more than that. Instead of just that, the audience is given a picture that emphasizes all the notable features of being African. The movie is mysterious in nature as not only do you get a variety of deep characters with a captivating villain, you also have a movie where a majority of the cast and minds behind it are African-Americans. A striking element of Black Panther was the astonishing chemistry between all the actors and their performances. Each character managed to have its own independence in nature and played pivotal roles in the flow of the movie. Nakia, who is played by Lupita Nyong’o is the love interest of T’Challa but has her own mind and character build that focuses on herself as a human being. She isn’t left to the part of solely the “love interest” (as most movies tend to do) operating only to enhance the protagonist but rather defines herself in her own way. Black Panther, goes beyond merely giving character independence, but represents a variety of characters who each have a special skill or interest. Throughout the movie, multiple strong female characters are shown. 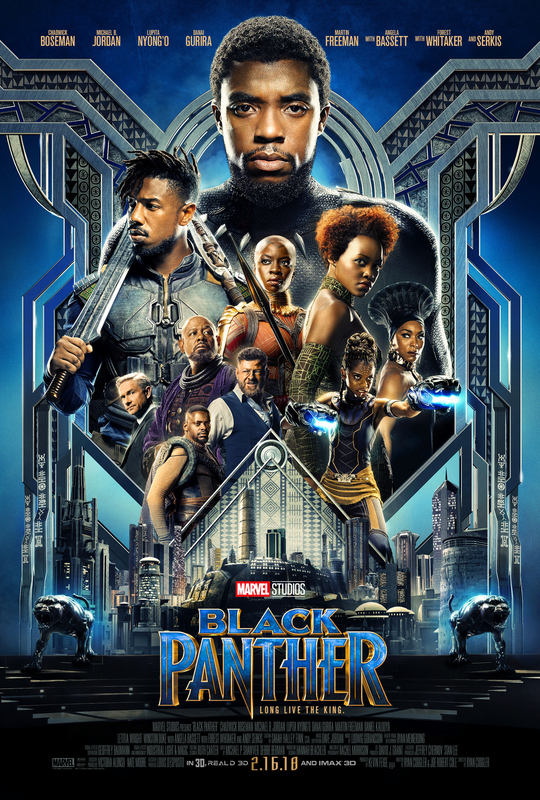 The film also has exciting villains, Erik Killmonger (Michael B. Jordan) and Ulysses Klaue (Andy Serkis) who have their own reasons for what they do. Killmonger is a villain that enchants the audience and helps create a story with emotional values. Klaue, however, is a deplorable pick of the crop villain that the audience is used to. Which worked interestingly that Killmonger ended up killing him, showing his predominance as the main villain. I was immensely disappointed that they killed off Klaue, one of the greater Marvel villains and he didn’t live to see the second half of the movie. Kinda sad. Chadwick Boseman, who plays the role of Black Panther, appears to be very constricted in his actions. But it’s because of the enduring personality that adds weight to the story and makes the audience cheer for him to the very end. Our modern society lives in an age where people of color and minorities are struggled to represent on screen and in the media. And so a quite intriguing area of the film is the way they recognize a few South African languages on screen in a superhero movie. Black Panther includes numerous scenes where conversations in South African languages take place and it brings an unbelievable pride in it. Kendrick Lamar and the Weeknd also deserve credit for their spectacular contribution to the film. The car chase scene would not have been the same if not for the soundtrack composed by these two artists. It gives you a hype feeling, heart racing and puts you in the shoes of the characters themselves. The moments in which the camera shows Africa outside of Wakanda, and then zoom into the city itself, make Wakanda feel like a futuristic version of what South Africa could look like. Yet, in the back of your head, you understand that it’s just a fantasy movie, but the imagination that it brings is undeniable. There is but one critical acclaim I have of the movie, and that is of the scarce action sequences. I expected more action from the film, but scenes in which inhabited action was marvelous. Director Ryan Coogler has done a remarkable job giving the audience a different kind of superhero movie. One that makes a statement, one that makes a stand on society today. And I’m sure it’s needless to say that the Marvel Cinematic Universe will nothing but benefit from this splendid making of a film. I would genuinely end this movie with a 10 out of 10. Congrats to the represented cast for crafting an amazing movie. In 2019, hurricanes, earthquakes, floods, droughts and every other form of destruction gave the world quite the situation to take care of. The world’s scientists came together to do something about it creating the “Dutch Boy” an interlocking net of thousands of satellites that surround the planet and counteract the destructive weather. Jake Lawson was the genius behind the design of the ‘Dutch Boy’ but he’s not the easiest guy to get along with and so they fire him and put his more politic brother, Max, in charge. Everything goes just great for three years until strange incidents begin to occur, a freeze in the desert, lava uproar in Hong Kong, and a scientist getting sucked out into space. Max has only one recourse: He’s got to call Jake back in for help. He’s the only one who really knows all the ins and outs of this orbital computer system. If anybody can fix this, it’ll be him. And hopefully Jake can fix it before…the Geostorm occurs. See, that’s nice and all and the title even has a nice ring to it, but the movie just ended up being a little too cliche. The dialogue was a little tacky, and in all honesty, once I got to the climax I was like ‘Haven’t I seen this movie before?” Of course, the answer was no but at that point I was skeptical, the moment where Jake fought Dustin or something, the spunky British kid it was all Deja-Vu for me. I was kind of hoping for there to be more destruction during the movie but in the end, there wasn’t all that much. The movie ended with them rebooting the ‘Dutch Boy’ which would shut it down temporarily. However, doesn’t that mean for a brief minute, huge storms and natural disasters could occur, at least when ‘Dutch Boy’ wasn’t counteracting those elements? But the reboot seemed to happen instantly and an ‘all’s well that ends well’ kind of thing. If even one pivotal character in the movie died, there could have been more density to the movie. But on top of the other cliches in the movie, all the ‘good’ characters you started with in the beginning lived to the end. There was that one super talented spy-like female, the nerdy little girl who’s into technology, (We all know in our modern age that’s not how it works), and then lastly the cocky and arrogant genius who can’t seem to learn social skills. It’s Armageddon all over again. However, on a positive note, I really liked the climax part of the movie, you can never seem to do a car chase wrong and director Dean Devlin did that perfectly. And the plot twist at the end where Dekkom, (Ed Harris) turned out to be the villain and nearly shot Max in the head. Overall, I thought the movies visual effects and action sequences were great, aside from my critique of other things I was quite entertained by this film. Really I don’t think you’ll lose anything watching this movie just be prepared to see some same old same old cliches but the movie is enjoyable as a whole. I give this movie a 6/10 rating. Who doesn’t love a comedy filled action flick? I mean the critics ate up Guardians of The Galaxy, they absolutely loved it. Perfectly timed punchlines, well thought out jokes and ironic moments even non-marvel fans understood. 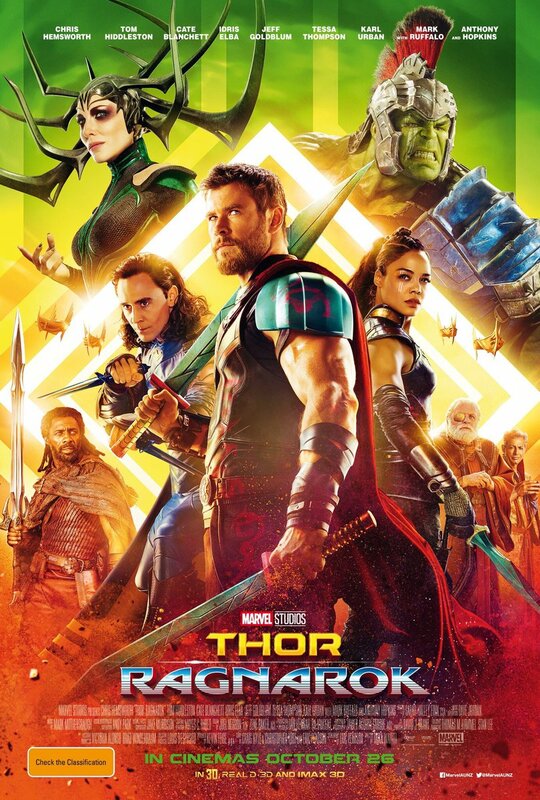 So Taika Waititi took bits and pieces from that, and has fabulously presented us “Thor Ragnarok.” A comedic action flick, with a dire lack of consistency. I was honestly disappointed at the end of the movie for the lack of cliche. Yes, I said it. I missed the cliche. Most people rant about how a movie is too cliche and how the plot was quite predictable. This movie was so out of place that it kind of defied that standard. Introduced to the villain early in the movie, you think “Oh yes! 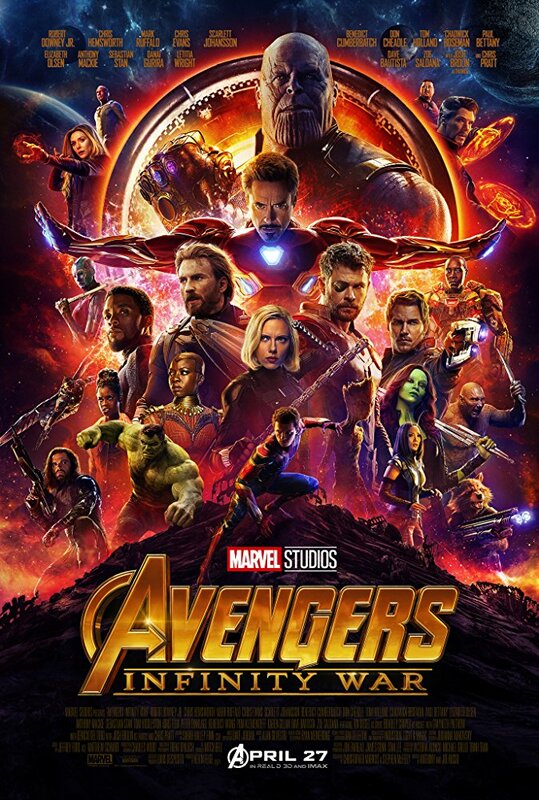 Finally, a Marvel movie that consistently focuses on the villain.” But in the end, Marvel pulls its old “I got ya there!” and directs the attention back to Thor, and a lot of unnecessary characters… Although I’ll have to say that Korgs interjections are absolutely hilarious, it’s unexplainable the amount of comedic quality he contributed to the movie. And his voice-well you watch the movie and see for your self. Dressed in skin-tight black gear and sporting a twisting, spiked headdress, Hella looks like Taika Waititi saw Maleficent and said “I want her. But MARVElous!” Sorry, I had to squeeze in that joke. In her first encounter with her brothers, she demonstrates her intense power by destroying Thor’s hammer and banishing him to a distant universe while she sets about wreaking havoc to Asgard. Asgard is one of those places that, was made to be destroyed. And Waititi was given the challenge with fulfilling Ragnarok yet still make it a “happy ending” Hugs and kisses friendship galore! I’ll let you be the judge of how well he succeeds, since as far as I’m concerned, the less time spent on Asgard, the better. At any rate, it’s quite frankly for the better that Hella is free to wreak havoc on Asgard while Thor and Loki are stranded on Sakaar, which is sort of an intergalactic trash dump where heroes are forced to compete in elaborate gladiator battles. To explain further would spoil certain surprises that the audience I’m sure would enjoy. Needless to say, the GrandMaster ideally rules Sakaar and forces Thor to fight…a familiar opponent. Shortly after, Thor, a Valkyrie, Loki, and another friend…escape through the Devil’s [insert word here] to Asgard. I truly felt that this movie was kind of dancing around everywhere, without a consistent plot line. Beautifully crafted and hilarious, but a work in progress like the other Thor movies usually are. This particular movie lost the Shakespearean quality that Chris Hemsworth’s past movies have had. And I can’t believe I’m saying this but even the Stan Lee cameo was frankly irritating and seemed forced… which was another setback. The comedy was forced in numerous places, and the director tried so hard to make this a comedy film that he had to squeeze all the gory violence into the last half hour. In the end, this movie was sadly a disappointment, a failed attempt at a Guardians of the Galaxy knockoff and a quite forced “comedy” film. In the end, my ratings shouldn’t directly impact your thoughts so I’d suggest you watch the movie yourself before taking any of my critique to the head.